You can now activate the quarterly bonus for your Chase Freedom card. 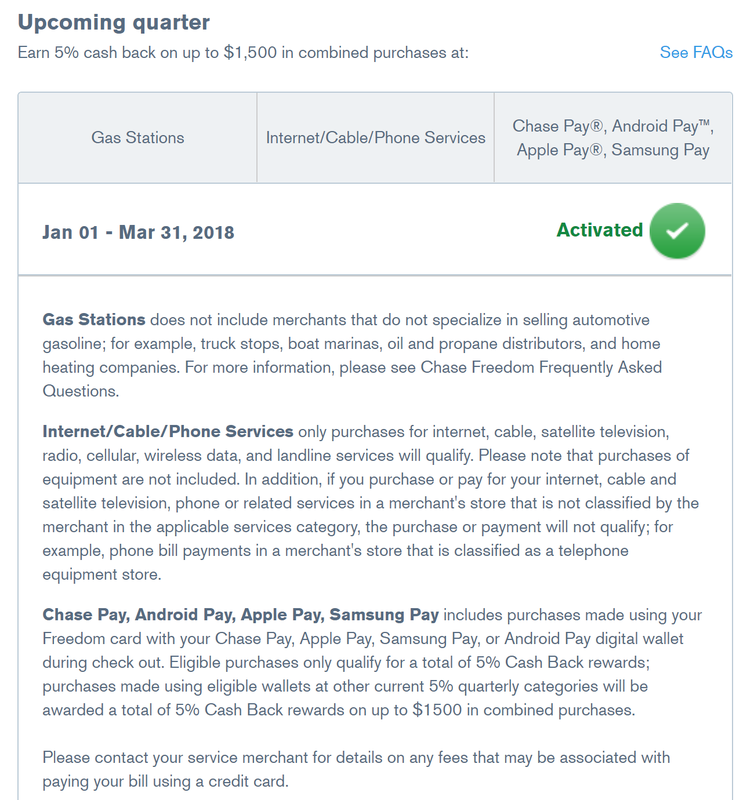 Starting January 1 through March 31, 2018, you will receive 5% cash back on the first $1,500 in qualifying purchases at Gas Stations, Internet, Cable, Phone Services and mobile payments made with Chase Pay, Android Pay, Apple Pay or Samsung Pay linked with your Chase Freedom card. Gas stations are a quarterly regular, but the two other categories are new to the Freedom bonus categories. Internet, Cable and Phone Services has been a regular bonus category earning 5x the rewards with Chase Ink Plus and Chase Ink Cash cards for business owners. Mobile payments made with Chase Pay, Android Pay, Apple Pay or Samsung Pay with your linked Chase Freedom card can open many new venues for 5x points or cash back earning that have always been unavailable. With so many new ways to earn 5x the rewards with the Chase Freedom in 2018, I am looking forward to starting off a prosperous points and miles New Year.